Image caption Clockwise from top left: Gerard Docherty, Steven McCardle, Francis Mulligan, David Sell, Barry O'Neill and Martyn Fitzsimmons. A cocaine gang kidnapped and brutally tortured a man over money they thought he owed them, a court has been told. Nine men appeared at the High Court in Glasgow as details of their involvement in drugs, firearms, violence and dirty money were outlined. 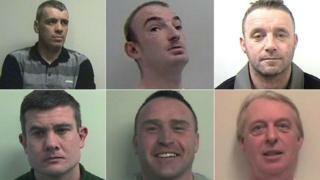 Their criminal business was described as "the most sophisticated" encountered by police in Scotland. Other incidents linked to the gang include a shooting at the family home of a gangland figure. David Sell, 50, Barry O'Neill, 37, Anthony Woods, 44, Francis Mulligan, 41, Michael Bowman, 30, Mark Richardson, 30, Gerard Docherty, 42, Steven McArdle, 33, and Martyn Fitzsimmons, 37, had earlier pled guilty to various charges. A two-hour narrative of the facts of the case was presented by prosecutor Alex Prentice QC. The men were caught following four major investigations into serious and organised crime. Links between different cases emerged after a large consignment of firearms was found in an "engineered compartment" of a Honda CR-V car. The weapons included Glocks, a Beretta, sub-machine guns, a grenade and bullets. Mr Prentice said of the group: "Their operation centres on the importation of vast quantities of cocaine. "Their role is as wholesalers to other organised crime groups. They are at the top of the chain in terms of drugs transactions in Scotland and the UK as a whole." The court was told the men were involved in "firearm trafficking" to "violently enforce their own operation." Mr Prentice added: "The firepower at the disposal of this crime group is unprecedented in terms of the history of organised crime in Scotland." The court heard in detail about the gang's violent dealings with drug dealer Robert Allan. He met Barry O'Neill in March 2013 in Glasgow's west end in connection with a £45,000 cocaine haul. Mr Allan later complained about the "quality" of the drugs. It was agreed with a member of the crime gang he could return some of the drugs - but had to pay £30,000. Unable to come up with the money, Mr Allan fled Scotland for Barnsley, South Yorkshire. In March 2015, the gang found him and abducted him - driving him in chains to an industrial unit in Fauldhouse, West Lothian. While he was held there, Mr Allan was beaten with a heavy chain, a metal bar and a sledgehammer. He was also stripped and sprayed with bleach. He was later driven, hooded, to a rural location near East Kilbride in Lanarkshire before being taken out of a car and shot three times in the legs. Mr Allan was found by members of the public. In another of the incidents described to the court, Gerard Docherty fired shots at the home of Robert Kelbie in Ratho, Edinburgh. Mr Kelbie was at home with his ex-partner, two children, his mother and sister. Judge Lord Beckett remanded all nine men in custody and deferred sentence until next month.